A recent visit to the just opened addition to the Tate Modern Gallery in London by architects Herzog and de Meuron has provided the impetus to post an article that I wrote some months ago about the new Vancouver Art Gallery conceptual design. Switch House, as the Tate addition is named, is an inspired project by exceptional architects and serves to heighten the level of expectation for Vancouver. The unveiling of architects Heurzog and de Meuron’s new Vancouver Art Gallery (VAG) conceptual design by partner Christine Binswager and associate Simon Demeuse last fall raised eyebrows, elicited praise, ridicule and, significantly, stimulated lively and impassioned discussions about architecture in this city. Concentrated in a seemingly simple stack of wooden boxes is a dense world of ideas about urban design, public institutions, history, local and global architecture, politics and iconography. The design’s ambition provides a welcome opportunity to both broaden and deepen the local architectural discourse. At its most basic level, the architectural concept for the Art Gallery is of an elevated seven-storey “tower” arising from a central courtyard with the whole surrounded by a low perimeter block one storey in height – a square donut with the elevated stacked boxes hovering over the central void. The street-level perimeter block and floor below house public gallery spaces, a café, a store and educational facilities. The main gallery spaces, a 350-seat auditorium and administration spaces are in the suspended block that begins three storeys up supported on four large piers. The building can be seen as an unusual hybrid of urban typologies combining the European perimeter block tradition with that of the North American tower in open plaza. Both typologies exist separately in Vancouver with the tower/plaza form particularly common along Georgia Street where the new Art Gallery will reside. A precedent for the short tower form that comes to mind is the seminal West Coast Transmission building also on Georgia. This building too has a small footprint with its main bulk cantilevered and, in this case, suspended from cables over a large plaza below. The European perimeter block type finds a relation at the new Athletes’ Village in southeast False Creek. While the perimeter structures of the Art gallery are much lower, they similarly build up tight to the street edge and have outdoor space enclosed within a courtyard. Thankfully, the typology of tower sitting on low-rise podium, so beloved of Vancouver’s city planners and residential developers, and currently ubiquitous, has been rejected in favour of something more interesting. There is merit in the idea of creating the types of clearly defined and enclosed outdoor urban spaces that have been so successful in Europe and elsewhere but are relatively rare in Vancouver. While some European modernists see a tyranny in the relentless application of this typology in their cities, the public served by these popular urban spaces is kinder. The antithesis to the perimeter block type exists throughout Vancouver, including across Georgia from the gallery in what is one of the worst urban space in town, the Vancouver Public Library. There, the large, convex form of the “iconic” building leaves a bland, unwelcoming, and poorly defined public plaza of little interest or vitality. Similarly, the West Coast Transmission Building floats elegantly above a carefully designed but lifeless plaza. The VAG architects argue determinedly that this city does not need more ill defined public spaces. Nevertheless, of particular interest in the Herzog and de Meuron proposal is the potential success or failure of a courtyard that has the underside of a tower looming over it. Large, covered, outdoor spaces, even those with coverings high above, are often themselves dull and lifeless. Recent proposals in pricey Vancouver re-imagine spaces below bridge on-ramps and try to make the best out of challenging circumstances. While the Art Gallery tower is no overpass, the covered outdoor space created below has some affinity. The architects have created a potential problem they now need to creatively turn to advantage. The beginnings of a strategy to infuse life into this important civic space are suggested by some of the early renderings showing a well-lit and warmly wooded court but the design of this space remains some distance from being convincing. The courtyard in the middle of the project is also at the centre of an important discussion around the public nature of the VAG spaces and extends to how these might be influenced by programming and admission cost. Under its current leadership the Vancouver Art Gallery has had considerable success with its outreach into the local community and in engaging a diverse group of people. One might argue that the Art Gallery is more public than it has ever been. The Herzog and de Meuron proposal attempts to take the idea of public accessibility a step further by providing free and public gallery space at, and below, street level. With glazing to the street and a courtyard that doubles as installation space, the art here will be highly visible and easily accessible to all. That the gallery spaces at the base are separated by four storeys from those in the tower is given a rationale by differentiating those below as free to the public while those above are for paid admission. Should the VAG decide in the future to charge admission to the lower spaces, then the conceptual design, with its vertical organization and relatively distant separation of galleries, makes less sense. The ground level perimeter spaces, though having openings into the courtyard on all four sides, are, in the current schematic design, obstructive to public access and effectively turn what should be a fully public space into one that is semi-public and potentially unwelcoming. The architects’ desire to create defined space with a sense of enclosure is in tension with the similarly strong desire to have an open, inclusive and fully public institution vitally integrated with the city it serves. The design might be improved by opening up one entire side of the perimeter structure to the street. Given the importance of the Georgia Street address, which is also south facing, the architects might consider removing the grade level structures on this side to make the courtyard U-shaped and fully inviting on one side. In addition, shifting the tower northwards would bring more of the courtyard out from under the tower and into the full daylight so precious and appreciated in cloudy Vancouver. While the street level relationships and urban design moves will be major factors determining the success of the new VAG, for most of the public, its striking appearance is what is most significant at this time. The architects, global superstars, have been at pains to obtain an understanding of the cultural history of the local site and the West Coast in general and to try and situate their project in its specific place and time. The image of the stacked wood boxes elevated above the site supported on large piers is highly evocative. The wide range of imagery conjured suggests the forms are sufficiently abstract to avoid the kitsch or pastiche of more overtly post-modern designs with their literal appropriations. Christine Binswager has cited a trip to Haida Gwaii as inspirational and praised the work of First Nations carvers there. 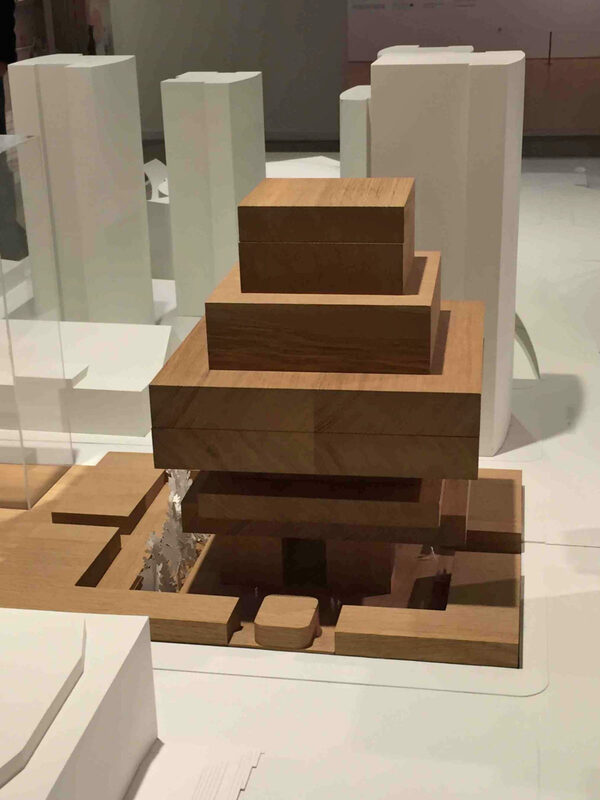 For some, the Art gallery design suggests a series of indigenous carved cedar boxes stacked up or a totem pole. Others see what might be considered an unfortunate association with an inuksuk, a traditional Inuit stacked stone landmark used as the symbol for Vancouver’s 2010 Winter Olympic Games and now a rather hackneyed cliché that tourists associate with the city. What one might visualize in the raised boxes is innumerable – a tree, a pile of books, a person, a Donald Judd minimalist sculpture. The evocation of the traditional culture of local indigenous peoples, however subtle, is significant; major institutions like North American art galleries are mostly still evolving out of a highly Eurocentric and colonial history. The Swiss architects are channeling a zeitgeist that seeks to elevate and express solidarity with those who are still oppressed in our society and at the forefront of a relentless battle to protect the lands and waters on which we all depend. It would be interesting to see in the gallery design as it develops, a deeper reflection of what that First Nations’ cultures represent with respect to the human relationship to nature – a nature being destroyed by overpopulation, industrial development and, the defining issue of our time – climate change. In addition to the above-noted cultural references, the architecture also harks back to a west coast modernist tradition and works by Arthur Erickson. The elevated volumes, outward stepping soffits and long, linear forms bear echoes of Simon Fraser University and nearby Robson Square. The pervasive use of one material, in this case wood rather than concrete, creates a calm environment and calls attention to subtle shifts of light in a manner also favoured by the local master. With the virtues come the challenges of the predecessor’s work like the large shadowed outdoor spaces and the semi-private public realms. Lacking in the new VAG design is the fluidity and dynamism of the best work of Erickson. The new design is rigidly symmetrical and static both at grade and in the tower above. 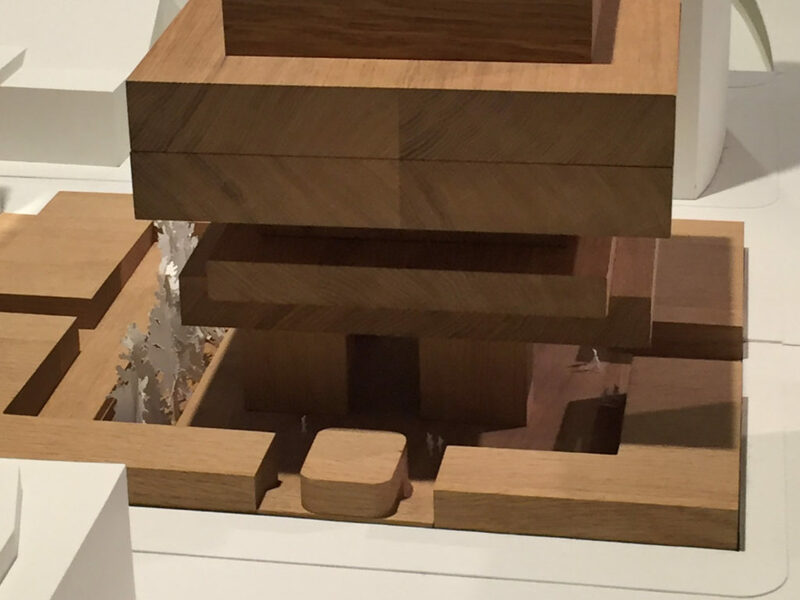 Even at this early level of conceptual design, the Heurzog and de Meuron proposal for the new Vancouver Art Gallery presents an intensely dense concentration of ideas about place, architecture and history. The scheme is bold, rigorous and original and provides a strong conceptual base for further development. Within a site context of wide roads and dissipated urban spaces, the architects are choosing to make a clearly defined public place, a courtyard contained at the edges and corners, and animated by public galleries, art, a café and educational facilities. Clearly understood is the desire to make the new art gallery more fully public and engaging. Clearly important also is the history and culture of the place where the project will be built. The connection to history, memory and place provides layers of meaning to a structure that is also highly abstract and experiential. As the design is only in the early stages, it clearly needs development. One would hope that improvements to come would take the design to a less rigid and static place, a place more fully public and inviting at street level and one responsive to solar orientation in this grey city. At this point though, Vancouver has a very thoughtful and strong base design from outstanding architects from whom expectations are high indeed. The opening of the stunning Switch House addition to the Tate Modern in London provides an interesting counterpoint the Vancouver’s gallery. Both projects benefit from the considered and thoughtful response to their respective contexts. Both have vertically organized gallery spaces. It will be interesting to compare and contrast the projects when the Vancouver Art Gallery design is more developed. Posted in NEWS and tagged with Heurzog & de Meuron Vancouver art gallery .